The world of EVE is moving ever closer to a fully integrated market economy, where the thousands of inhabited planets, moons, asteroids and their accompanying space stations are able to do business on a galactic scale. Today the world is divided into numerous market regions, most spanning several constellations. Wares being sold or sought after within the market region are accessible for trade anywhere within the region. The cornerstone of the market economy is the inter-stellar communication method coupled with a reliable and efficient way for striking a deal over long distance. Before instantaneous communication from one star to another came into being, trading over long distances (between solar systems) was hazardous and time-consuming. Frauds and swindlers were in abundance, making trades with strangers highly risky. The time it took to find out what stations in nearby solar systems had on offer or demanded, plus the time it then took to strike a deal and ship the products to and fro, stifled space commerce so much that it was almost non-existent. Only the adventures were willing to risk their assets and even their lives by pursuing space trading, but the potential riches involved urged people on and made them yearn for a quicker, easier way to do business between the stars. Thus, once inter-stellar communication devices arrived they spread out like an epidemic and inter-stellar commerce quickly followed in their wake. At first, inter-stellar commerce was conducted in a haphazard sort of way, giving the frauds ample opportunities to cash in on the optimistic and naïve traders. It quickly became clear that instant communication between solar systems alone could not keep commerce clean. Every empire responded on their own, setting trade regulations, hiring special commerce inspectors and setting up secure trade houses. These efforts managed to create a fairly safe trade environment. But once constellations and other regions started to set up a regional market network, where traders were able to view everything for sale anywhere in the region and put their own items up for sale, there arose the need for a centralized agency responsible for inter-stellar commerce. 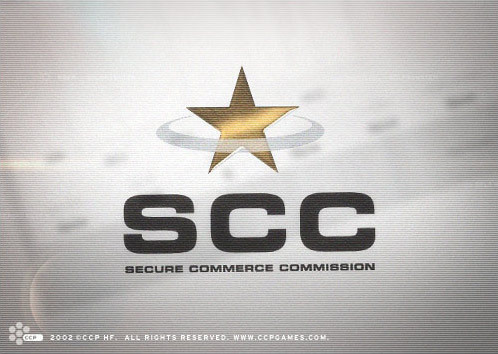 This is where the SCC - Secure Commerce Committee - came into being. As a division within the CONCORD the SCC is jointly run by the empires and thus ensures a safe and universally regulated trade environment. A joint initiative of the Minmatar Republic and the Jovian Empire have also ensured that the SCC, although under the control of the empires through the CONCORD, acts under the strictest neutrality codes, the same as the InterBus and other empire-run institutions. This is to ensure that all dealings are not only secure, but also secret, with no chance of governmental interference. The unfortunate by-product of this is that those acting on the wrong side of the law can just as easily do business with each other as anyone else.